This facility was made possible by grant support from the W.M. Keck Foundation, the National Science Foundation, and the Geology Foundation of the University of Texas at Austin. Additional funding was provided by the College of Natural Sciences and College of Liberal Arts at the University of Texas at Austin. Since 1999, UTCT has been a national shared multi-user facility supported by the Instrumentation and Facilities Program of NSF’s Earth Sciences (EAR) directorate. To learn more, check out our Vision Plan and our 2016 External Advisory Panel Report. Our ACTIS scanner was completely upgraded by North Star Imaging, Inc. in 2013. Our objective in the design specifications for the new system was to acquire an instrument that would extend the capabilities of the BIR scanner it was designed to replace and complement the capabilities of our Zeiss (formerly Xradia) system (i.e., capable of penetrating specimens of greater density, a decimeter-sized detector, and spatial resolution on the order of tens to hundreds of microns). The NSI scanner comprises two X-ray sources and within a single radiation-safety enclosure. Of the two X-ray sources, one yields ultra-high-resolution data on small objects that can be penetrated by relatively low-energy X-rays; the other yields high-resolution data on larger or denser objects that can be penetrated only by higher-energy X-rays. Ultra-high-resolution Subsystem. The high-resolution system was designed to perform tomography of specimens up to 30 cm in diameter and employs a 225-kV FeinFocus microfocal X-ray source. 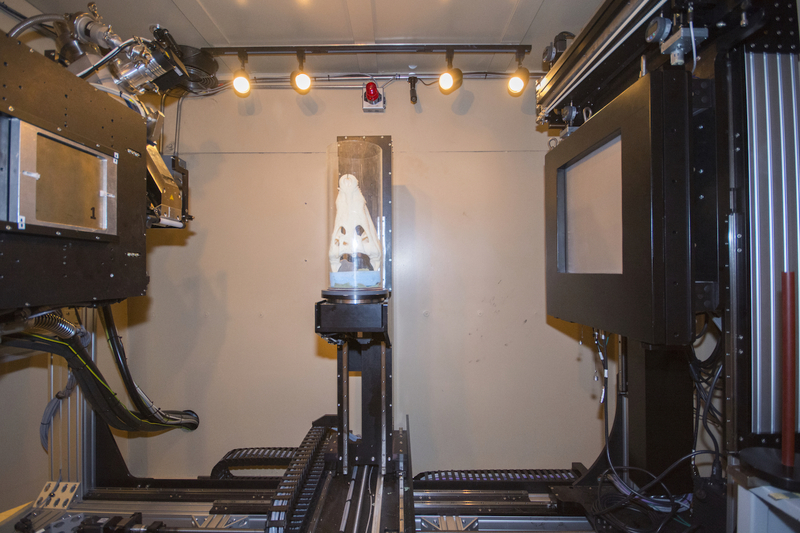 The system’s magnification, which increases with the specimen’s proximity to the X-ray source, combines with the fixed pixel size of the flat panel detector to determine the limits of spatial resolution. The great flexibility of this system allows imaging of specimens from 5 to 300 mm in diameter with spatial resolution in the 10 µm range. In addition, the ability of the microfocal source to provide a stable X-ray output even at low mean energies, combined with the sensitivity of the flat panel detector, permits excellent discrimination among materials of closely similar attenuation in specimens that can be penetrated by relatively low-energy radiation. High-Energy Subsystem. To perform tomography on large specimens the NSI scanner employs a 450-kV GE Titan X-ray source, and the rotating specimen stage can accommodate samples up to 100 kg in weight. 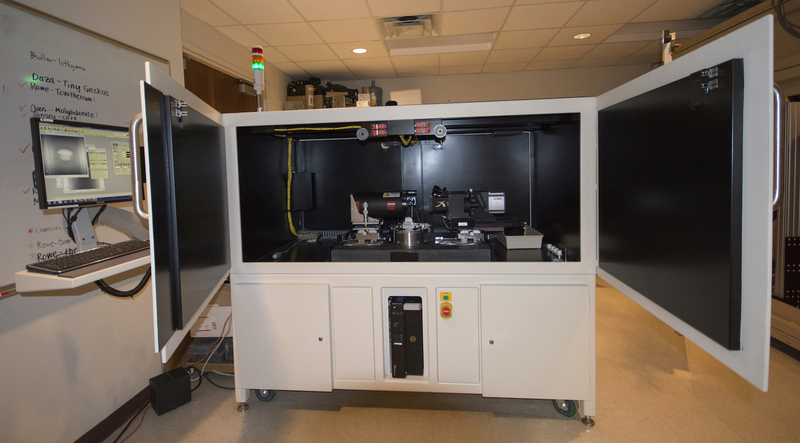 The high-energy subsystem can image specimens up to 36 cm in diameter (provided the specimens can be adequately penetrated by the X-ray source). The turntable is capable of 750 mm of vertical motion so large specimens (e.g., segments of drill cores) can be scanned. At the opposite end of the size spectrum, this subsystem can also be used to scan any smaller specimen, including specimens that the high-resolution subsystem (FeinFocus) X-ray source cannot adequately penetrate; therefore any sample for which ~100 µm spatial resolution is sufficient can be imaged. Detector. Both X-ray sources can be used with our detector: a high-resolution flat-panel detector for use in cone-beam tomography. Our 2048×2048 Perkin Elmer flat-panel detector can be used for both volume and helical CT scanning, with scan durations ranging from a few minutes to hours. This detector permits cone-beam acquisition (i.e., the gathering of 1000-2000 slices in a single rotation of the sample). It can be used either in a high-resolution mode, or (by sacrificing resolution, but increasing sensitivity) in a binning mode that doubles the effective pitch of the detector elements. 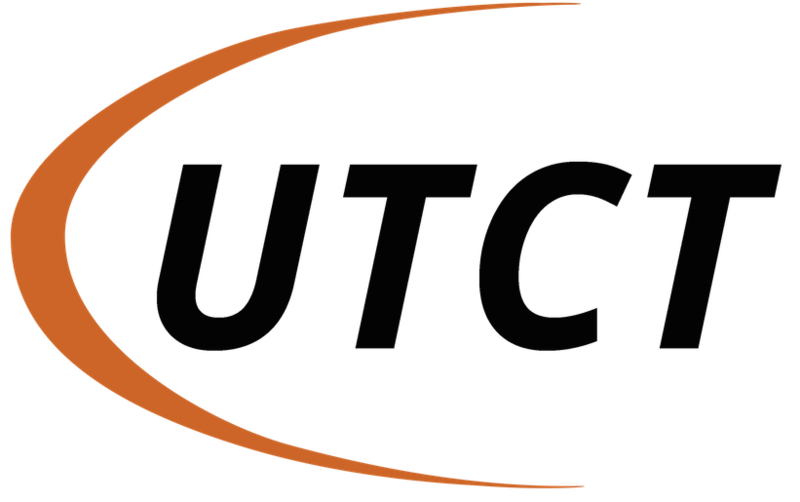 In 2008 UTCT acquired a microXCT 400 scanner built by Zeiss (formerly Xradia, Inc.) of Concord, California, to provide the facility with the capability of scanning specimens smaller and/or less attenuating than could be effectively imaged using our other subsystems. Like the NSI scanner, the microXCT utilizes cone-beam acquisition: data for up to 2000 slices covering an entire volume can be acquired in a single rotation. Because the height of the scan field is equivalent to its width, high-aspect-ratio specimens must generally be scanned in contiguous parts and the parts then matched together. The microXCT scanner features a Hamamatsu X-ray source capable of energies from 40 to 150 kV. The detectors are mounted on microscope objectives with magnifications ranging from 0.4X to 40X; the former yields a field of view of ~55 mm, whereas the latter yields ~0.5 mm. Thus the spatial resolution for the microXCT ranges from ~55 µm to less than 1 µm. The microXCT scanner also offers the advantage of enhanced phase contrast to better image materials with low mean atomic numbers such as soft tissues and polymers. Special hardware and software — and a repository of specialized technical expertise — are required in order to extract full scientific value from the a CT data volume. Because data volumes for 3D reconstruction are generally very large (ranging from ~2 gigabytes for a single volume of 1024² pixel images to ~8 gigabytes for a single volume of 2048² images), their manipulation requires high-end computational resources capable of managing and rapidly processing immense amounts of data. Visualization often relies upon 3D renderings of specimens, and usually benefits from the ability to render some portions of the specimen (i.e., those that occupy a specified range of densities and thus a particular range of grayscale values) as transparent or semi-transparent, to enhance different features of scientific interest (e.g., emu embryo, garnet porphyroblasts). Viewing these renderings and interactively modifying them is essential, enabling a user to examine the digital version of the specimen at any arbitrary viewing angle, or cut a virtual section through any point in any orientation (e.g., Herrerasaurus). Animations of sequential views at successive equally spaced angles, simulating rotation of the specimen about an arbitrary axis, are often the best means of examining relationships among features (various examples may be viewed on our examples page for CT applications). For large CT datasets, these advanced visualizations require fast hardware running specialized software, many of them demanding a surprising degree of proficiency with the software to accomplish one’s desired aims. Because systems capable of meeting these exacting requirements, and the expertise to use them effectively, are often not available to potential users at their home institutions, an adjacent computer laboratory dedicated to the processing of the digital images acquired from our CT scanners is a vital adjunct. 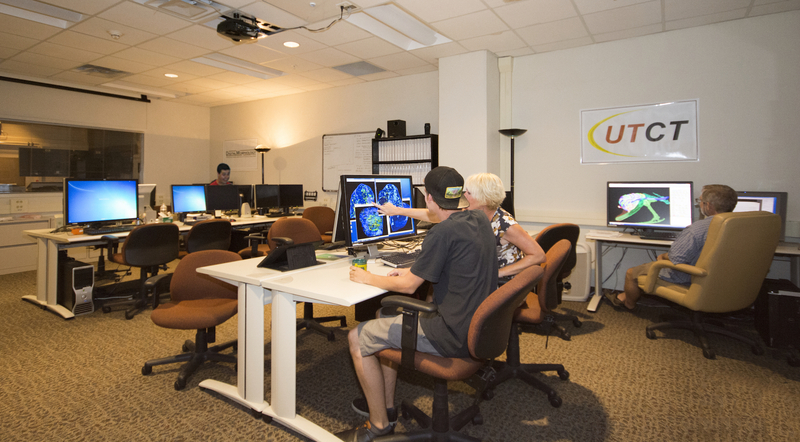 The digital imageanalysis laboratory is able to provide services to outside investigators and convert data into formats easily integrated into their existing research programs. The same experienced research scientists responsible for day-to-day operation of the CT scanners also staff the image-analysis laboratory, ensuring proper interpretation of the data and maintenance of its integrity throughout processing.